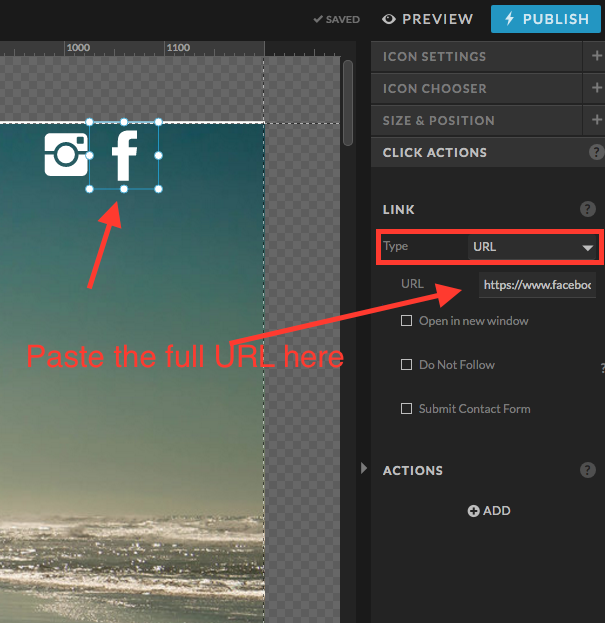 Learn how to link social icons to your social media pages in Showit. To link your social media icons, first locate those icons in your site design or add social icons to your design. Next open your social media pages you wish to add in another browser tab and copy the full URL of the social page. Once you have the URL copied, select the icon or element you wish to add the link to. With the element selected go to the click actions tab and choose the URL type click action. Then past the full social site URL into the URL field. There you have it! You can use these same instructions to link any external URL you want visitors on your site to be able to find from your Showit site. You can create a custom link to Snapchat to help grow your Snapchat following! When the icon is clicked, the Snapchat app will launch on the user's device and they will have the option to add your business. Be sure that the icon is only set to show on mobile, as this icon will not function the same on desktop when using that link. Also, uncheck the Open in new Window selection so that the app is launched directly from your site.